I few years ago (I think it was in 2004) I signed up for weight watchers and it helped me lose about 30 pounds. Well over the past few years, especially since last spring, I’ve started to gain it back. I don’t seem to be able to lose it on my own. So I’ve joined weight watchers at work to help me. I typically need some external help to accomplish something like this. This along with my running course should keep me busy this fall. Sometimes you just have to stay home and get some housework done. I had some honey-do’s that needed to be taken care of this weekend. Actually it’s been months and I’ve been lazy so I finally got around to them. This included stopping by my insurance agent and by the tax collector to tell them I’ve paid off my car loan so they can remove the lien-holder from the title. In addition we are canceling an old but recently expensive credit card. This was one which we’ve had for over 10 years, and accidentally was late on a payment a few months ago so they boosted the rate to a ridiculous percentage. I phoned them for a better rate since we’d been such good customers and they said sorry maybe in 6 months they would lower it. Well screw them. We paid it off, canceled it, and got a totally new one from the credit union. Over the years they probably have made thousands off us and they won’t any longer – bye bye a**holes. Can you tell that I’m upset. And if you think I’m upset you should hear my dear partner – cover your ears. Well it’s their loss. On another less emotional item I cleaned the master bathroom today. I scrubbed, rubbed, and tubbed the entire place. On my hands and knees with a brush, and finally I stood in the shower stall naked and sprayed it with mold and mildew spray and cleaned it until it sparkled. The cleaners I used made it tough to breathe in those confined spaces especially the shower stall. So I kept the fan going and every so often I had to leave the room for fresh air. Yet it’s done. The mirror is spotless. 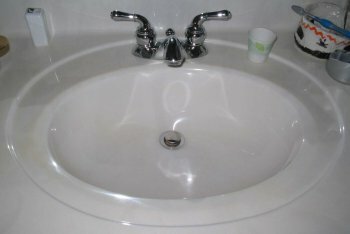 The sink is shiny and sealed with surface protectant. The toilet bowl is wand scrubbed with lime-a-way, and hand-scrubbed with a scouring pad (ugh). And the shower, ah the shower, is brush scrubbed, and bathed in industrial mildew and mold cleaning agents. Nothin’ like a toxic bath of chemicals to make this bathroom again usable to mankind. As part of a great deal from the IBM Country Club, Katie and I bought tickets to SeaWorld in San Antonio on Saturday. The whole bundle included parking, two entry tickets, and two meal tickets. This is known as IBM Family Day. We left Austin about 8 AM and arrived at about 10:30 AM. The longest line of the day was just to get into the parking lot. Here we are at the beginning of our day together. Although thousands of IBMers and their families would be there the adventure park was open to the public. However, this was a tax free weekend in Texas so the attendance would be down because most people would be at stores buying clothes, and supplies for the upcoming school season. We decided to not carry a backpack and to keep it light. We planned to see the shows and just take it easy. So we headed to the Sea Lion show first which was cute. Afterwards we headed around the lake towards the roller coasters and I was teasing Katie about going on some of the roller coasters (the park has two). She was saying no, no, no. I didn’t know how they would affect me since the onset of my balance problems and my operation. I doubted that I’d be able to handle them. However as we passed the Steel Eel jokingly I angled her in and although she objected at first she let me guide her in. We found there were NO LINES and soon we were on the ride in the last car. 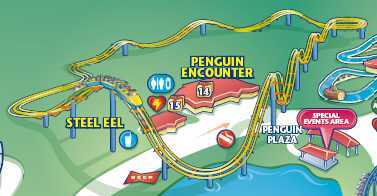 Well this coaster has a massive up and then lots of ups and downs like the undulations of an eel. Katie did not like going up the big hill and shut her eyes. The anticipation of the drop bothered her and she had a death grip on the handrail throughout, however afterwards she and I were both giddy with the adrenaline. We staggered out, and continued around the lake. She and I had survived. Next we needed something more sedate so we waited for 45 minutes for the Texas Spash Down log plume. The weather was getting hotter, but overall it was mostly cloudy and the day was cooler than a typical mid-August day – it was somewhere in the 80s. Expecting to get wet and therefore cooler, the ride was disappointing and we had only gotten a few sprinkles on us. As we walked by the Great White coaster. I remembered the previous time Katie and I had been to SeaWorld years ago (probably over 10 years ago) where my head was knocked around quite a bit. And I didn’t want that to happen again. However, the sign out front said 0-5 minutes wait. So on the spur of the moment we went in. Although Katie was pushing to sit in the back I forced her in the second row up front. On this ride you sit in a seat with your legs hanging free. Also this one was not so high and it looped over and over. Afterwards I felt that this was the best ride, but if there is ever a next time I want to be in the front row. After that we were done with the rides. So off we went to find a bathroom and lunch. After another line we got some tortilla wraps which we ate while walking, because we wanted to get to the Shamu show next. We were now getting hot. We got there in plenty of time and sat on the third row – these seat were labeled “Splash Zone”. Having been to SeaWorld before we knew what we were doing. We wanted to cool down, or should I say we wanted to be cooled down. The show as great and near the end our section was instructed to make hand signals so the massive killer whales would splash us. Well not much happened. We got a few sprinkles. We thought that was it, but the trainers realized that the whales hadn’t done what they asked them to do, so they sent them back to do it right – after this we were soaking wet with 52 degree water. Water was dripping from my hat, my shirt, and my shoes – I was totally wet, but hey I was cooler now. After the show we headed over to the Ski show, and still wet we again sat in the “Splash Zone”, but the personal watercraft never got close to the power of those killer whales to drench us. We were now getting tired so we went to several of the aquariums and saw penguins, sharks, and dolphins. Somewhere in there we went to a trained animal show that was cute and included trained dogs, cats (yes, really they had trained cats), a porcupine, and a kangaroo – amazing. By that time we both had had it, so we got a small bite to eat, and then headed home. We did all that we wanted to do at a pace that was not frantic. Overall Katie and I had a wonderful day at SeaWorld. Just a short post to say that Saturday was busy for me. Celeste and I ran the 10 mile Town Lake loop crossing MoPac and the Longhorn Dam from 7 AM to 9 AM. The weather was hot starting in the high 70s Fahrenheit and ending in the low 80s – too hot to run. We ran and chatted about things, and at times we walked. Then I went back home to clean up since I was soaked with sweat, and then turned around and went downtown to a Robot Sumo contest where I was volunteering. On the way I stopped and bought a new pair of running sneakers that I desperately needed for weeks or maybe months. Arriving at the contest I helped set up and assisted the score keeper with his duties. However I couldn’t stay to the end. I had to leave early to attend a marriage re-commitment ceremony for out friends Kathy and Ken 30th anniversary. This meant getting on a shirt, tie, and suit coat in the mens room of the Austin Recreation Center where the contest was being held. So one minute I was in shorts and a tee-shirt and the next I was in coat and tie. I felt like Superman entering a phone booth and a second later emerging dressed in cape and tights. I don’t think anyone recognized me at the contest. Well anyways, the re-commitment ceremony was a lovely affair. Their children, Helen, Paul and Mariah, had arranged for friends and family to attend as a surprise. Then afterwards the children had a reception for their mother and father. It was almost a complete wedding experience but alas no garters were removed or bouquets were thrown. Nevertheless by the end of the day I was dragging. 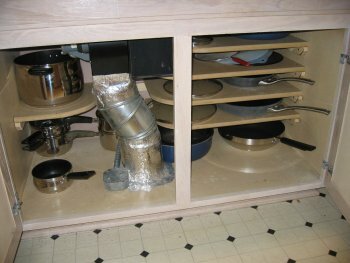 This weekend Katie and I built shelves under the island cooktop. This has been something that Kathy has wanted for years. We also did it because Matthew has become an MDF (Medium-Density Fibreboard) master carpenter, and we tried to show him that we had the right stuff, but I doubt that we even came close. For example, we shaped all the shelf edges with the router just like he’s done in his home. We put one shelf on the left for pots, and four shelves on the right for pansSorry for not posting in quite a while. I was on vacation for a couple of weeks, then focused on work including a trip to Eastern Europe (Serbia, Romania, and Poland). Now I’m back. 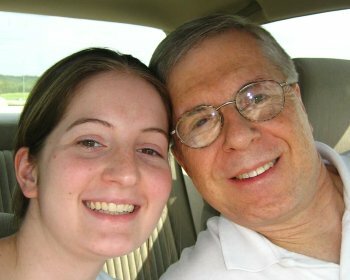 You are currently browsing the Watt's Up blog archives for August, 2008.